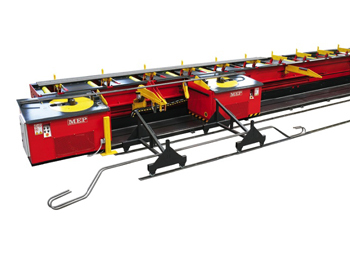 Machinery Indents has many years of industry experience, which gives us the knowledge and expertise to provide the very best in steel rebar bending and shaping machines. We have built an impeccable reputation for quality products and exceptional service, with clients from around the country returning for all their automatic bar bending requirements. We make it easy to find high-quality machines and equipment with an extensive range. We only put our name behind the best, giving you peace of mind that you can find the right bar bending and shaping machines to suit your project and budget. Take a look at our selection below. Discover more about what we can do for your by getting in touch with us today. Our helpful and friendly staff will be happy to provide answers to any questions you may have and give you all the information you need to choose the equipment best for your needs. Pick up the phone and call us today on 03 9357 9896. You can also use our online enquiry form and we will get back to you as soon as we can. Completely automatic plant, electronically controlled, for the production of medium to large sized stirrups and bent/shaped bars, with bends on either one or both ends of the bar, as well as the cutting to length of bar material. The CUT FORM system, thanks to the use of a single translational mobile clamp and a bidirectional bending unit, allows the maximum production flexibility, eliminating any operator manual intervention during the work cycle, guaranteeing the maximum accuracy and excellent overall product quality. 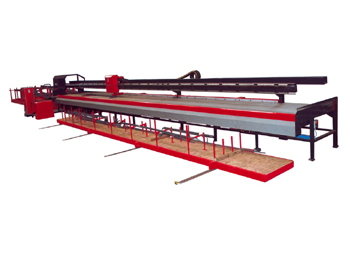 The Syntax Line is a complete and fully automated cut and bend station for processing of stock rebar. The complete production cycle (loading, cut and bend) is conceived to be carried out in full automation, without requiring any manual handling by the operator. All CS Series double head benders can be installed in different configurations fitting the specific production requirements. Along with versions having one mobile head at whatever side, the unit is also available in configuration with two mobile heads capable to work simultaneously and so assuring very high productivity. The automatic double head benders belonging to the "CS 440-460" series are designed for production of stirrups and large shapes bended clockwise or counter- clockwise on both sides. The bending sequences are controlled in full automatic mode without requiring any intervention by the operator during the working cycle, so granting high productivity along with quality of finished products. Multiradius 32 is the most innovative solution in this field thanks to its exclusive patented solutions which allow to produce radius, spirals and curved segments having also variable radius within the same bar, in a fully automatic way. The SYNTAX HS Series can offer an outstanding flexibility of application, and the capability of processing double wire up to 12 mm in all versions, and single wire 16 mm with the SYNTAX 16 HS. The large production capacity, as well as the adaptability in different production configurations, makes the SYNTAX 12-16 HS capable to reduce the number of required equipment, as well as in the number of machinery operators, therefore reducing drastically the production cost per unit of weight. Copyright © Machinery Indents Pty Ltd.